Please note that we are located in Toronto, Canada and we do NOT ship our puppies. littermates, household pets and my family so I know their personalities well. get to know you a little and to understand what you are looking for in a puppy. help us match you, as a potential buyer, with a dog that will ultimately turn out to be what you are looking for. a Cavalier puppy will be offered. Also there are no right or wrong answers! placed based on a wide variety of things including temperament, natural instinct, and suitability. from the day they are conceived until the day (hopefully long in the future) when they pass on. questions or just about anything else! complete and return this questionnaire in a timely fashion. occasionally things get lost in cyber space. following questions as completely as you can, and return this form when you've finished. To be on our waiting list you must first complete the Adoption Questionnaire. We will contact you with more details about current and expected litters. When a litter is born you will be among the first to know. 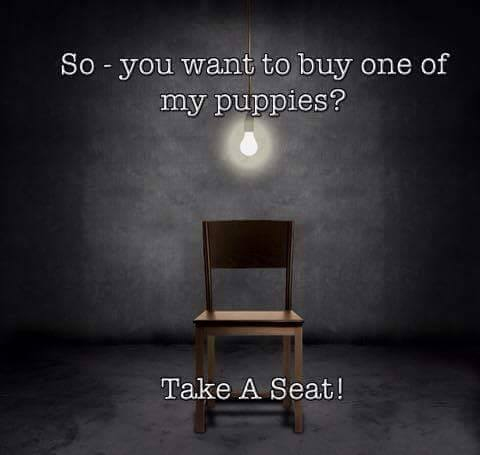 If you see a puppy you like a non-refundable deposit can be taken to hold your puppy. The deposit will be deducted from the total sales amount. Once your puppy is reserved we will send pictures and video updates often. Thank you for your interest in a puppy from "CavalierKingCharlesSpanielDogs.com"
and for considering adding one of our puppies to your family.